UPDATED – MONTREAL (CNS) — Father Claude Grou, the rector of St. Joseph’s Oratory of Mount Royal who was stabbed during a Mass March 22, has been released from the hospital. After his release March 23, Father Grou issued a statement of thanks for all the messages of support. During the 8:30 a.m. Mass in the crypt March 22, a tall, light-skinned man wearing a white hat walked toward Father Grou and stabbed him in the stomach. Father Grou got up, and members of the security service managed to control the attacker. “Father Grou left the oratory, sitting in a wheelchair,” to the applause of some people, relieved to see that he was still conscious, explained Vu. Father Grou left the oratory in an ambulance. 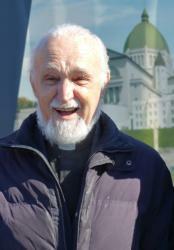 Father Grou, 77, is a native of St. Laurent, Quebec. He joined the Holy Cross Congregation in 1966 and was ordained to the priesthood in 1968. He was elected as the congregation’s superior general in 1986, an office he held until 1998. Since leaving that post, he has been working at St. Joseph’s Oratory, Canada’s largest church founded by St. Andre Bessette. Philippe Vaillancourt and staff at The Catholic Register in Toronto contributed to this story. Gloutnay is a reporter for Presence info, Montreal. Vaillancourt is editor of Presence info.